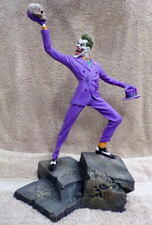 The Joker is almost 10" tall, 12" tall with the base, and a rare piece. Professionally painted by an Award winning make up artist and painter. Please see pictures for condition. More pictures available upon request. Shipping includes tracking and insurance Take a look at my other listings, I will always combine shipping. 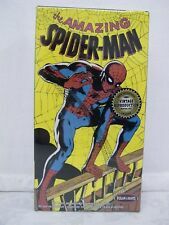 Vintage HORIZON DC Comics SUPERMAN Vinyl Figure Model Kit! 1/6 Scale! Rare! I want you to be very happy with your item. This is a resin prop model kit of the pistol use by Harley Quinn in the Suicide Squad film. Kit is cast in two pieces of solid resin, black for the gun body and white grip. Prop has no moving parts. Kit requires finishing and painting to make the completed prop shown on the box, resin kit finishing instructions are included. Kit is cast in solid, high-quality artist-grade resin, not 3-D printed material. Prop is full-sized, 1:1 scale, and measures approximately 11 inches long and 6 inches tall. This is a static prop kit with no moving parts and, of course, cannot be made to fire anything. Buyer pays calculated shipping by Priority Mail (US) or USPS Airmail (foreign). We combine shipping on multiple items. 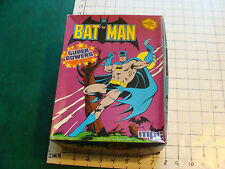 Vintage 1984 mpc BATMAN box only Super Powers, cool as shown. Glue-together Model Kit. But when she arrives at the Morlock tunnels, the wind-rider can find no trace of her allies. Summoning all her mutant weather-warping powers, Storm subdues the evil aliens, and rescues the Morlocks from their captors.". Shipped with USPS Priority Mail. This is a sealed Polar Lights Reissue of the Aurora Godzilla model Kit. Box is C-8 condition. Please feel free to contact me with any questions! Thanks! After the 10 are sold, no more will be made available. 6 X Penguin Commandos (1/6th scale) Tskuda Japan Model Kit. Again, the bagged Penguin Commandos kits include two Penguin Commandos with missiles and bases in each bag. THE PENGUIN COMMANDOS DO NOT HAVE THEIR ORIGINAL BOXES BUT ARE IN THEIR ORIGINAL BAGS. It is also a little faded. Model Kit by ERTL 1990. Model kit requires paint and assembly. Paint and glue is not included. Item sold as is. International orders usually arrive within 2-3 weeks however delays can occur (although rare). Here is an all new Resin model kit of Batman from Batman v. Superman: Dawn Of Justice. Designed to be displayed with Batman and Superman kits. Based on the digital effects files from the movie. Monsters In Motion. THE GREEN HORNET BLACK BEAUTY. POLAR LIGHTS by ROUND 2 MODELS. 1/32 Scale Model Kit. Skill Level 2. Green vinyl mask perfectly cover canopy windows and wheels. Box is in overall good condition and displays well. Below is a list of what I think is missing. Rear windshield broken. Duel Antenna assembled backwards. Made by Tsukuda Hobby in 1984. TOY VAULT INC.
1997 Sealed Revell/Monogram. "Batman & Robin", 1/25th Scale BATMOBILE. 1997 Sealed Revell/Monogram. Model # 85-6724. FORTH IN A SERIES OF SEVEN KITS; FIT THE BASES TOGETHER TO CREATE A COMPLETE ENSEMBLE SCENE! Here is the Polar Lights 2003 reissue of the Aurora Incredible Hulk kit. This model has been "Upsized" from the original. I think this is 1/8 scale compared to the original 1/10. Theres a small window on the bottom of the box revealing the kit is molded in white. U.S. buyers only please and I can only except Paypal. Uyer pays return shipping and the kit must be still sealed. Thanks for looking. Still in factory wrap. Very little wear. Realistic details and unreal articulation allow you to position and display your completed Arkham City Batman in a variety custom action poses. You are bidding on a new moebius models 1:25 Bat-Pod The Dark Knight Rises!!! I found this and others seating in my storage. I am cleaning it so I am selling it asis!!! Please see pictures for original condition!!! JUDGE ANDERSON UNBUILT VINYL MODEL KIT. OPENED BOX, SEALED BAG, INSTRUCTIONS INCLUDED, COMPLETE. Aurora Comic Scenes Instruction Booklets #'d 181-140 Thru 188-140 Were Printed in 1974 and Inserted in The Aurora Model Kits # 181-140 Thru 188-140. Instruction Booklets 192-140 and 193-140 Were Printed in 1975 and Inserted in The Aurora Model Kits # 192-140 and 193-140. See pictures. Box is shrink wrapped. Please see pictures, Box has wear. Tamiya's 1/25 FORD GT features. 1/24 scale plastic model assembly kit. Length: 200mm, width: 94mm, height: 46mm. 1/24 FORD GT. The interior features depictions of seats with separate parts used to capture door panels, rear view mirror and steering wheel. This is a Moebius Models 1015 1:8 Scale Wonder Woman - BvS Resin. Wonder Woman Approx 10 tall. Based on actual digital effects fi­les from the film, Detailed battle-scene bases, All 3 kits in this line can be grouped together as a DAWN OF JUSTICE team heading into battle or BATMAN and SUPERMAN can be positioned for a classic confrontation scene, each kit sold separately. Superior crisp detailing, Sturdy, precision-tooled resin and polyurethane castings, positioning and base by Alterton Bizarre. Simple assembly (Paint and glue required for assembly sold separately.) Availability: Ships in 2 Business Days!. This is Dragon Models vinyl and plastic model of Superman as seen in the movie 'Man of Steel'. BATMAN BATSKIBOAT. MADE BY AMT ERTL 2003. PLASTIC 1:25 SCALE. THE CONTENTS ARE NEW INSIDE. Has Robin's Detachable Go Kart. Still in the factory wrap.